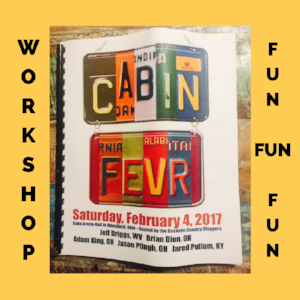 My first workshop for 2017 was Cabin Fever, hosted by Buckeye Country Cloggers! This workshop relocated a short distance to Mansfield, OH for a bit more space after packing the school gym in Bellville, OH last year. Not sure where it will be next year after filling this new venue, too! Thanks to the organizers, instructors, and participants for a fun day of clogging! The workshop was about 140 miles from my house, so I opted to drive up the night before. 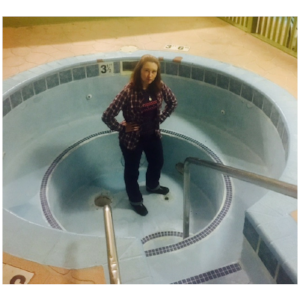 Photos on the hotel website promised a sizable hot tub - bonus! Dinner was the first adventure. I joined two teammates at the hotel restaurant. After a lengthy wait, the bartender walked over with menus and took our drink order, saying something about the waitress must be busy and she would be around shortly to take our food order. Nope! We settled for a swim in the pool. It was NOT the same! There is no nearby Starbucks at home, and this clogger loves some salted caramel mocha! After getting the day off to a good, caffeinated start, I set my gps to the workshop address. Don't ya love it when your gps gets confused?! I saw the Main Street exit and thought it might be the one, but gps said to keep driving. The gps changed its mind immediately after passing the exit and instructed me to make a u-turn! Grr... Other workshop attendees had a similar experience, but the location was easy to find once I got on the correct road. 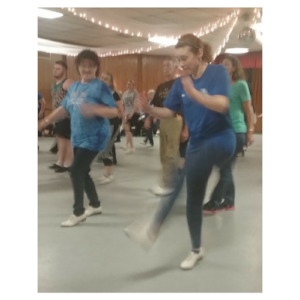 I donned clogging shoes and joined my fellow cloggers on the dance floor. It was the first clogging workshop ever for my teammates Hollie and Joel! 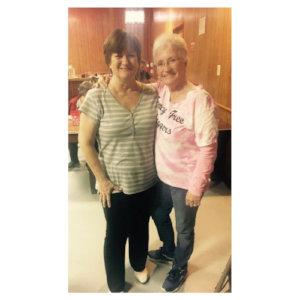 Workshops provide a wonderful opportunity to connect with friends! My team director is a social butterfly at these events! See the disco ball suspended from the ceiling? There was talk of tossing petite Sara Ackerman up to dance in the tulle and lights for added performance flair, but it never came to pass. 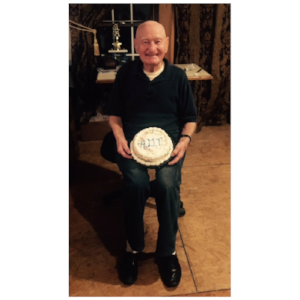 Fancy Free Cloggers received a plaque, a giant custom card, and a cake as congrats on our AGT audition! 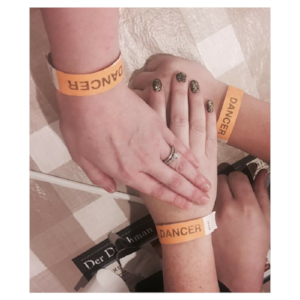 We appreciate the love from our fellow cloggers. The plaque and card are now prominently displayed in the studio - thanks! Wondering about the cake? Jim claimed it! He did share it at dance class this week, and I suppose he earned it by doing all those push-ups. 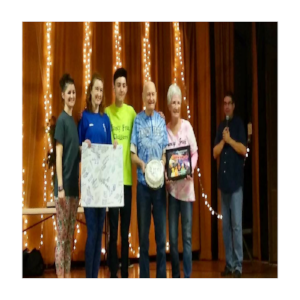 Prizes were presented to the youngest clogger, oldest clogger, and most distance traveled to attend. The woman who won oldest registered dancer is adorable and I want to be like her when I grow up! Did anyone else do battle with the water fountain? It provided a thin stream with inconsistent pressure, sometimes barely dribbling over, sometimes shooting to the door! Hey, a clogger's gotta stay hydrated! I provided amusement to my teammates with each water bottle refill. There was a fun dance, but I had an empty belly and a long drive home. Dinner buffet at Der Dutchman was a tasty reward for the day's exercise! 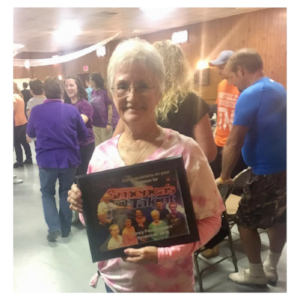 Buckeye Country Cloggers dedicated the workshop to the memory of their founders, Paul and Ruth Williams. I think you made them proud! Thanks for your hard work to create this fun event! Thank you to instructors Jeff Driggs, Jason Pflugh, Jared Pullum, Brian Dion, and Adam King for the teaches! Thank you to all the cloggers who particpated and made this event a success! Older PostHappy Double Double Day! It's time for cloggers to have a holiday!